A recent post discussed challenges about Cuba facing the Trump Administration this April: President Trump’s attendance at the Summit of the Americas in Peru and the U.S. reaction to Cuba’s election of the new President of the Council of State. Recent developments have added to the apprehension that these and other events may be occasions for more U.S. hostility towards Cuba. President Trump has nominated or appointed two officials who have a history of hostility towards Cuba–Mike Pompeo and John Bolton– while another appointee, Carlos Trujillo, may hold such views. President Trump has nominated Mike Pompeo, the current Director of the Central Intelligence Agency (CIA), as the next Secretary of State, a position that requires confirmation by the U.S. Senate. In 2015, when Pompeo was a member of the U.S. House of Representatives, he co-sponsored a bill, the Cuban Military Transparency Act, to prevent any U.S. financial transaction with companies managed by the Cuban military that did not become law, but was implemented last year by a President Trump executive order. In June 2017 Pompeo and Senator Marco Rubio (Rep., FL) met at CIA headquarters with several members of the Brigade 2506, which is a CIA-sponsored group of Cuban exiles formed in 1960 to attempt the military overthrow of the Cuban government headed by Fidel Castro and which in 1961 carried out the abortive Bay of Pigs Invasion landings. As Under Secretary of State for Arms Control, Bolton in 2002 accused Cuba of developing biological weapons in collaboration with U.S. adversaries and said Cuba remained a “terrorist” threat to the U.S. Bolton’s disputed claims were shown to be baseless in the 2004 National Intelligence Estimate, which found that while Cuba had the technical capability to produce biological agents, there was no evidence of any biological weapons development. Last week the U.S. Senate confirmed the nomination of Carlos Trujillo as the new U.S. Ambassador to OAS. I have not discovered Trujillo’s views about U.S. policy towards Cuba and the OAS relationship with the island, but given his background and support by Senator Rubio, I suspect that he too is hostile towards the Cuban government. Although not surprising, these developments are unfortunate for those of us who advocate for increased normalization between the two countries. We must continue to be vigilant in resisting any and all Trump Administration hostility towards Cuba. Rick Scott asks the OAS to exclude Raúl Castro from the Summit of the Americas, Diario de Cuba (Mar. 24, 2018). Press Release, Curbelo: Following Another Empty Voting Exercise on the Island, the Cuban People Need Support and Solidarity (Mar. 14, 2018). Falćon, Foreign Policy of the United States: the extremists circle closes, CubaDebate (Mar. 26, 2018); CIA, The Bay of Pigs Invasion; Brigade 2506, Wikipedia. Bolton, Obama’s outrageous Cuba capitulations, N.Y. Daily News (July 13, 2015); Center for Democracy in Americas, Cuba Central News Brief: 3/23/18; The regime complains of a possible worsening of relations with Washington after the appointment of Bolton, Diario de Cuba (Mar. 24, 2018). The Senate confirms Carlos Trujillo as US ambassador to the OAS, Diario de Cuba (Mar. 23, 2018); Press Release, Rubio Welcomes Confirmation of Carlos Trujillo to Serve as U.S. Ambassador to OAS (Mar. 23, 2018). Press Release, Diaz-Balart, South Florida Members of Congress Host Ambassador Haley for Latin American State of Affairs Discussion (Mar. 2, 2018). Washington releases funds for subversion in Cuba and border wall in Mexico, Granma (Mar. 25, 2018); Press Release, Engage Cuba Applauds Defeat of Budget Provision to Slash Funding for U.S. Embassy in Havana (Mar. 23, 2018). Only 28 miles west of Havana, Cuba has been developing the Mariel Special Economic Development Zone around a deep-water port. Now this project is reaching fruition. The BrasCuba factory — a joint venture between Brazil’s Souza Cruz and Cuba’s Tabacuba–will turn out Popular, Cohiba and H. Upmann cigarettes for export and the domestic market. Womy Equipment Rental, a Dutch company that rents cranes and other heavy equipment, has just finished its building as shown in this photograph. 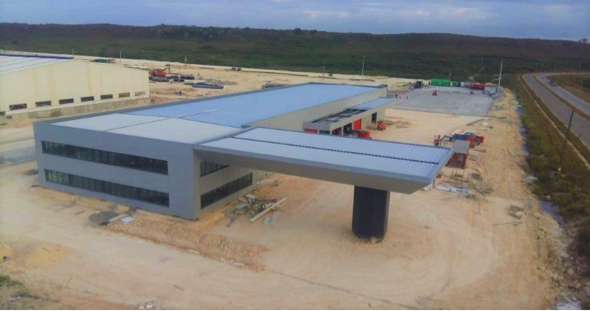 In addition, a site has been prepared for a Cuban biotech factory, and two foreign companies–BDC-Log and BDC-Tec– have begun operating in the zone’s logistics sector. Although only nine companies are currently operating there, another 18, including firms from Spain, the Netherlands, Panama, Brazil, Mexico, South Korea, Vietnam, France, Belgium, and Cuba itself have been approved and are getting ready to start. The port has more than 2,300 feet of wharf space, four super Post-Panamax cranes and the capacity to handle 820,000 cargo containers annually. In light of President Trump’s June 2017 announcement of still forthcoming regulatory restrictions on U.S. business’ doing business in Cuba, U.S. firms have been reluctant to make commitments for Mariel projects. Whitefield, Mariel is Cuba’s big industrial gamble. Could U.S. companies be among investors?, Miami Herald (Oct. 23, 2017). An earlier blog post discussed potential U.S. interest in Mariel. On July 14, Raúl Castro Ruz, Army General, First Secretary of the Communist Party of Cuba Central Committee and President of the Councils of State and Ministers, addressed a session of Cuba’s legislature (the National Assembly of People’s Power). A previous post discussed his remarks about Cuba’s private sector. He also made the following comments about the history of Cuba-U.S. relations. Castro’s review of the history of these relations was succinct, fact-based, fair and necessary for the two countries’ moving forward in a positive direction. These principles should govern U.S. relations with Cuba and every other country in the world. Castro Ruz, We will continue to advance along the path freely chosen by our people, Granma (July 17, 2017). Various aspects of this history have been discussed in the posts identified in List of Posts to dwkcommentaries–Topical: CUBA. “Mambises” refers to the guerrilla Cuban independence soldiers who fought against Spain in the Ten Years’ War (1868–78) and Cuban War of Independence (1895–98). This blog has frequently criticized the U.S. special immigration benefits for Cubans under the Cuban Adjustment Act and the wet foot/dry foot policy. On August 29 nine Latin American countries joined together to call for the U.S. to end these policies. Their joint letter was signed by the foreign ministers of Colombia, Costa Rica, Ecuador, El Salvador, Guatemala, Mexico, Nicaragua, Panama and Peru, all of which recently have been affected by large numbers of Cubans transiting through their countries to reach the U.S.-Mexico border and gain admittance to the U.S. under these policies. The letter also requested a meeting on these issues with Secretary of State John Kerry. Cuban migration indeed is a serious problem for these Latin American countries and for Cuba. More than 46,500 Cubans were admitted to the U.S. without visas during the first 10 months of the 2016 fiscal year compared with more than 43,000 in 2015 and just over 24,000 in 2014. See posts listed in “Cuban Migration to U.S., 2015-2016” in List of Posts to dwkcommentaries—Topical: Cuba. Ordońez, Nine Latin nations band together to plead with U.S. over Cuba, InCubaToday (Aug. 29. 2016); Telesur, Nine Latin American Countries Slam US for creating migrant crisis, Global Research (Aug. 29, 2016); Assoc. Press, LatAm Diplomats Urge US to Change Policy on Cuban Migrants, N.Y. Times (Aug. 29, 2016). Editorial, Neighbors Question Cuba Migration Policy, N.Y. Times (Aug. 31, 2016). Oppenheimer, It’s time to change Cubans’ special immigration status, InCubaToday (Aug. 31, 2016). U.S. State Dep’t, Daily Press Briefing (Aug. 30, 2016). Since late last year large numbers of Cuban migrants have traveled by land through Central America to try to reach the U.S.-Mexico border where they will be paroled into the U.S. This movement of Cubans continues, and on May 9, Panama’s President Juan Carlos Varela announced he had agreed with his Mexican counterpart to fly 3,800 Cubans already stranded for weeks in Panama to the Mexico-U.S. border at the Cubans’ expense. The flights began that day and will last two to three weeks. Varela said it was a difficult decision, but necessary because Nicaragua closed its border to Cubans last year and impeded their journey north and more recently Costa Rica had done likewise. As a result, this March Panama organized flights to Mexico for 1,300 Cubans while insisting such flights would not be repeated. On May 9 the Panamanian government took additional action to confront this problem by closing its southern border with Colombia in an effort to stop the flow. “We’ve taken the difficult decision to close the border with Colombia in the Puerto Obaldia area and in other parts of the border to prevent the trafficking of illegal immigrants,” Varela said. Here are a few of the posts regarding Cuban migrants in Central America: Resolution of Problem of Cuban Migrants Stranded in Costa Rica (Dec. 30, 2015); Cuban Migration Developments (Jan. 21, 2016); Another Cuban Migrant Problem in Central America (April 17, 2016). Reuters, Panama Closes Border With Colombia to Stem Migrant Flow, N.Y. Times (May 9, 2016); Assoc. Press, Panama Closes Border to Cubans, Flies Others to Mexico, N.Y. Times (May 9, 2016); Panama begins more flights of Cuban migrants to Mexico, BBC News (May 9, 2016); Wyss, Cuban migrants face dangerous, grueling jungle trip as Panama clamps down, Miami Herald (May 9, 2016).